Colts select defenceman Rasmus Andersson 37th overall in the 2014 CHL Import draft. - Very Barrie Colts | A website covering the Barrie Colts of the OHL. Home Barrie Colts blog CHL Draft OHL Colts select defenceman Rasmus Andersson 37th overall in the 2014 CHL Import draft. Colts select defenceman Rasmus Andersson 37th overall in the 2014 CHL Import draft. Barrie Colts General Manager Jason Ford announces that the team has selected Rasmus Andersson in the 1st round, 37th overall in the CHL Import Draft today. 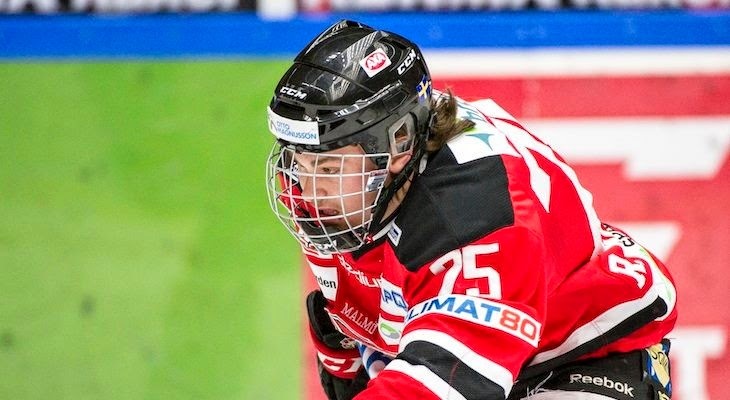 The 17 year old defenceman from Sweeden spent last season with the Malmo Redhawks last season. There, he finished the season with 10 assists and 13 points in 43 games which made him 4th for d-men on the roster. He was also the youngest player on the roster. “This selection fits an organizational need, and we are very excited about what he will bring to the hockey club,” added Ford. Date of Birth: October 27, 1996.